" Busy? ", you say. "I thought that January is more like a 'slow season' in Asheville ..." And you would be correct. What we mean is that, at Abbington Green Bed & Breakfast Inn, we have been renovating, keeping things in 'tip-top-shape' in this glorious historic house. 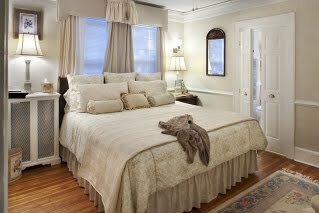 Our philosophy is that the home, with its historic origins, should provide a feeling of understated elegance that one would find in the world of the early 1900s, but also ensure that your bed and breakfast stay includes the up-to-date amenities that the 21st century has to offer. And it's all designed to help make your next visit to Asheville truly relaxing, soothing and filled with terrific memories. So what's new? Well, Kensington Garden Suite has a spacious private sitting/ media room. You can curl up quietly with a good book and dream the hours away. Or watch the 55" LED HiDef TV that's also 3-D, plus a Blu-ray disc player. Any movie, sports event or TV show in HiDef is a great experience...the characters look as if they're ready to step out of the picture. And the DVR allows you to speed through advertisements, if you find them less than entertaining. 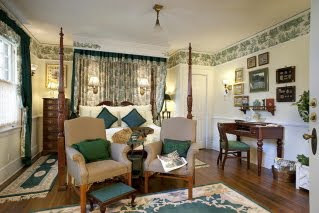 Kensington Garden Suite,like all our accommodations, has a lovely and comfortable king size bed. It's a cherry four-poster bed with elegant, custom-made draperies on its half-tester canopy. After all, what would the bed and breakfast experience be without a truly restful night's sleep? The bedroom also features a corner fireplace with an oak mantel that is original to the house...a warm fire can feel very cozy when the weather is chilly outside. And also, the two full, marble and tile baths, each with a state-of-the-art Sanijet whirlpool with a 'rainshower' above, provide luxurious bathing and relaxing hydro-therapy. Queen Mary's Garden room also was renovated recently. It is our smallest room but it does not lack any of the lovely features you require to make your bed and breakfast visit to Asheville restful and memorable. The bed is king size with a mahogany sleigh headboard. 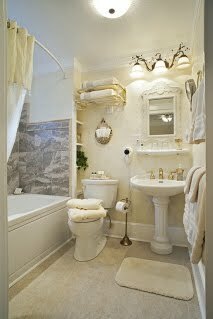 The fabrics are soothing shades of ivory, taupe and white throughout the room. 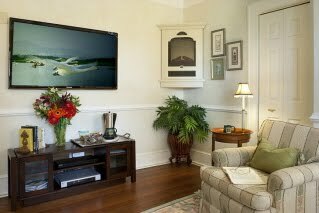 A wall-mounted flat screen TV with DVD, corner electric fireplace plus a pair of wing-back chairs add comfort. 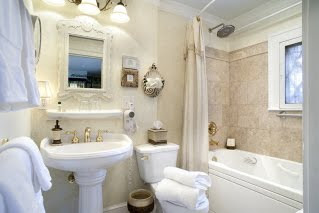 And the lovely bath with Sanijet whirlpool and rain shower above, custom surround of marble and tiles, European towel warmer are designed to make your experience at this Asheville bed and breakfast unhurried and truly relaxing.